Dee Kotinas died February 25, 2018 in Phoenix Arizona, at the age of 75. Dee was the founder of ABC (Animals Benefit Club) and H.E.A.R. (Hope Emergency Animal Rescue). assisted by Melanie Wesley as Treasurer and Liz Lopez as Consultant. The following is the new mission: H.E.A.R. has entered into a partnership with Maricopa County Animal Care and Control to provide emergency medical care for at risk pets, including injured, abused, and sick animals. In addition H.E.A.R. will raise and donate funds to purchase emergency medications for Valley Fever, Tic Fever, Parvo, etc. for the pet population of Man’copa County Animal Care and Control. A copy of the Memorandum of Understanding with Maricopa County Animal Care and Control can be found here on the website. School Background So Phx Rescues 1979 started ABC. Received the Golden Bell Award from State Education for an effective and innovatative program. Rabies Animals Care & Control Advisory Council 16 yrs. As Programs Chairperson. Worked with cities in Maricopa County on many Animal Welfare & Control issues. Deﬁning negligent care and cruelty issues: dog and cook ﬁghting, use of steel jaw traps, humane shelters and pet store minimal health care of animals. Maricopa County Wide Mandatory Spay and Neuter of all shelter and governmental impound sites. Passed in each of 13 cities, Maricopa County Board of Supervisors then went to State Legislature with Susan Svitak MAC Director. This was a major accomplishment in 1988! City of Phoenix advisor to the Mayor and City Council for eight (8) years. Established $15,000 annual free spay/neuter fund for people who couldn’t afford it. Finished construction of 2 acre Sanctuary with help from students in 1991. 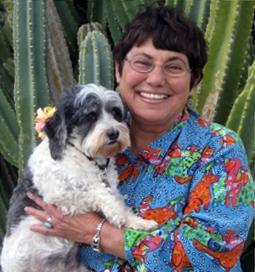 Afﬁliate of Delta Society and established the ﬁrst Pet Partner, Pet Assisted Therapy program throughout Arizona. Only certiﬁed instructor in Arizona. Trained and certiﬁed 567 animal/handler teams now Visiting hospitals, hospice, special needs schools for children, rehab centers, nursing homes impacting the lives of more than 50,000 individuals each year since we started in J anuary 2000. Closely assisted Sheriff J 06 Arpaio and staff in setting up his animal rescue MASH. Been requested as an “expert witness” in animal cases including a direct call from judges serving Maricopa County. Coordinated the continuation of the Animal Emergency Services Progtgm a national award winning program started by Treva Slote 1n 1974. ABS prevented needless suffering by providing medical treatment 24/7 at emergency animal Clinics for any injured or sick stray. This program provided a humane alternative to leaving animals to suffer and die curbside. After the passing of Treva Slote, started Hope Emergency Animal Rescue (HEAR) to continue Treva’ s programs.